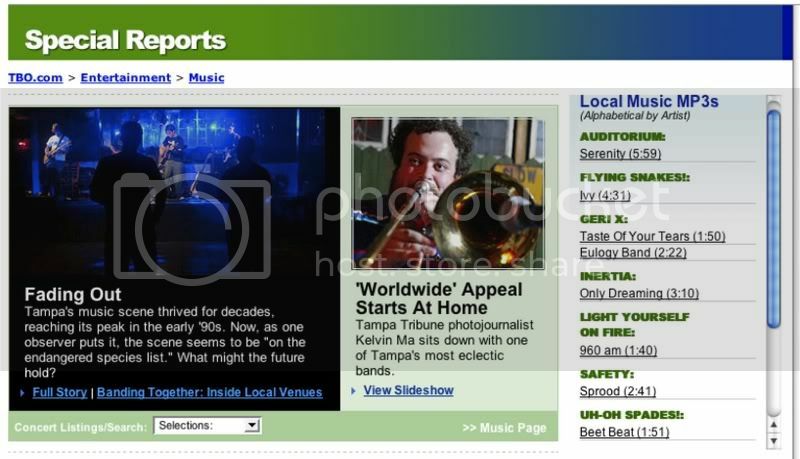 * Big thanks to Leilani Polk at the Loaf for repping our 02-25-11 show at Ella's. 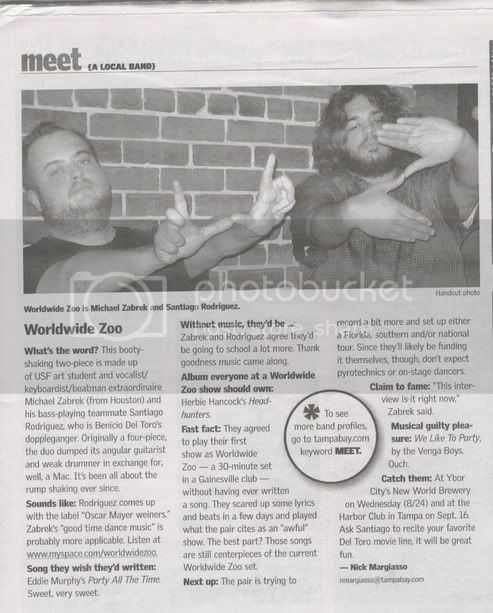 * Now that all the formalities are out of the way, check out Wade Tatangelo reppin' our 'Roots Deep/Dust:30' 7-inch single release show at Kelly's Pub on 10-17-08...you could also scroll down to see a picture of the write up, but it always looks way gnarlier in print. 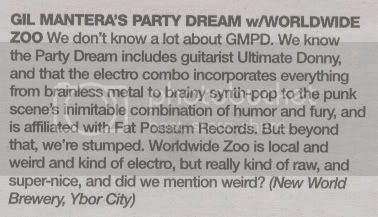 * Once again, the uber-thorough Wade Tatangelo of Creative Loafing infamy brings us a to-the-point blurb plugging our debut show at Skipper's Smokehouse on 01-06-08. 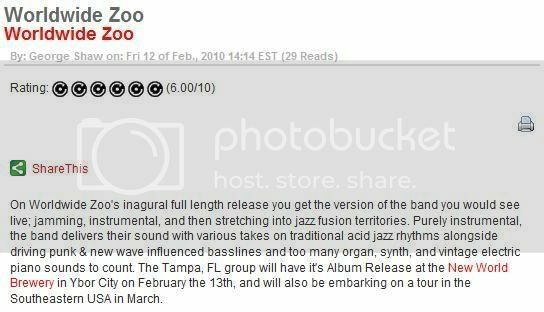 * We hope you all had the chance to scope the 12-07-07 edition of the Tampa Bay Times to see Worldwide Zoo in the weekly 'Meet the Band' feature, courtesy of the lovely Julie Garisto. The archived issue is available online to view on page T27. 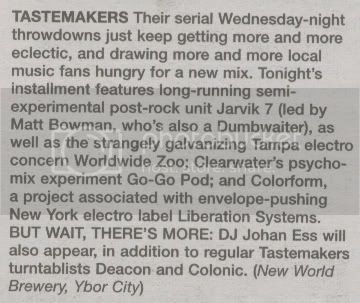 * Check out the rad words we got courtesy of Julie Garisto in both the Tampa Bay Times (and possibly the St. Pete Times?) recently plugging our debut show at Yeoman's on 11-03-07. 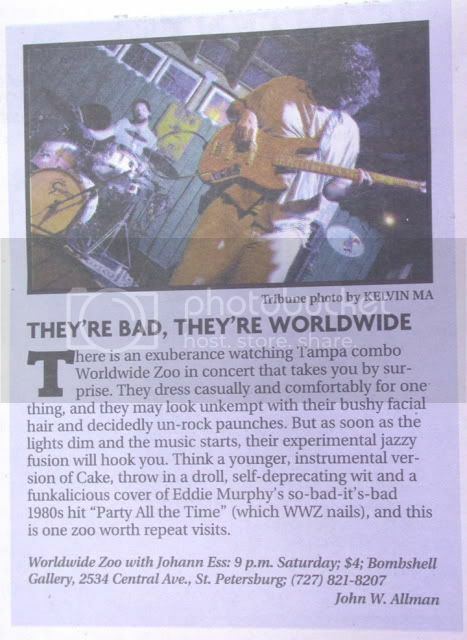 * Halloween night was the Rock Candy get-down at Czar, and we were lucky enough to get some love from Creative Loafing courtesy of Wade Tatangelo and Lelani Polk. 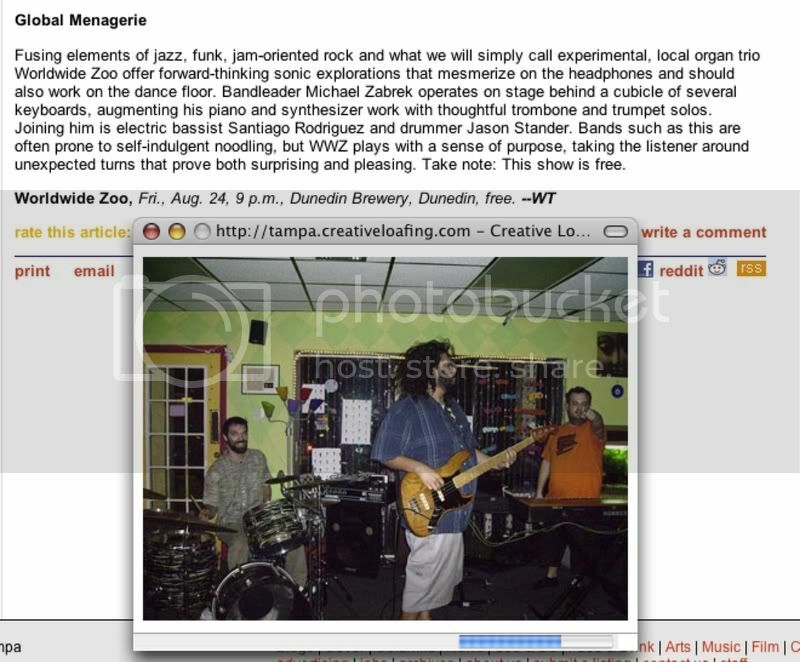 We were known as Word Wide Zoo for this show only...so if you missed this one, well...there are always the pictures. 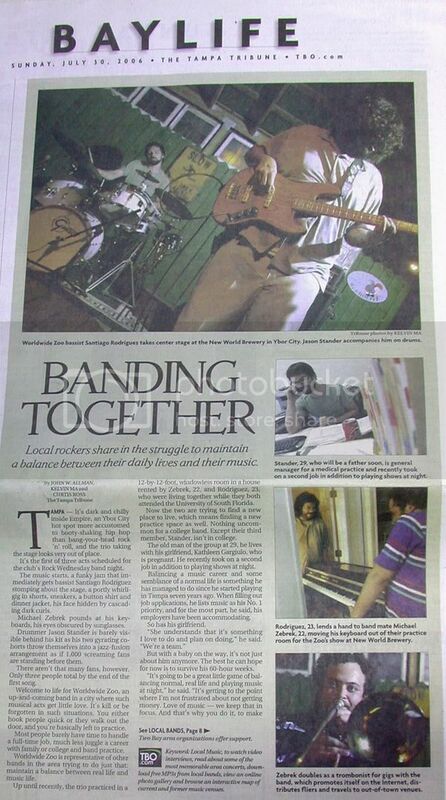 * Once again, we get some printed love courtesy of Wade Tatangelo at the Loaf. We can't help but be super thankful for the continued kind words, and used them as fuel for the fire that ripped through the Emerald on 10-19-07. Skull and Bone Band helped us kick out the jams like we was the MC5 if you can dig it. * This one is a quick and easy shout out for the get-down that took place at Kelly's Pub on 09-14-07...and you know this...MAAAAANNNN!!! Big ups to W.T. at the C.L.! * This one was just in time for our get-down at Dunedin Brewery on 08-24-07. Thanks for making a boring work day that much more tolerable Wade! * Here is another little bit o'love from our friends at Creative Loafing in time for our June 16th stint at Sacred Grounds Coffeehouse. I didn't see anyone credited for this one, but we thank you regardless! 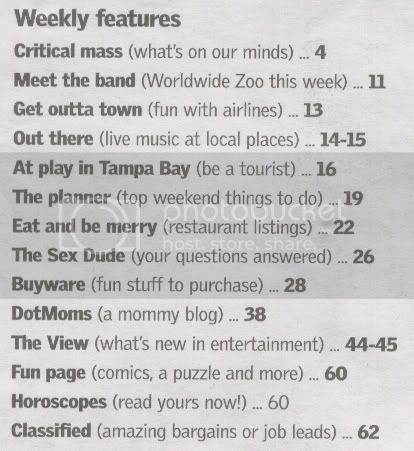 * Julie Garisto of the St. Pete Times/Tampa Bay Times had these kind words to say in the 03-23-07 issue of TBT in a feature called the 'Ultimate Local Band Guide', which featured nearly/over 100 local acts! * Next up are a couple of Leilani Polk quickies hyping up the madness that went down on 03-23-07 at New World Brewery with Poetry n' Lotion, Nervous Turkey, Ophelia, and dem Crate Brothers. Thanks a million Leilani! 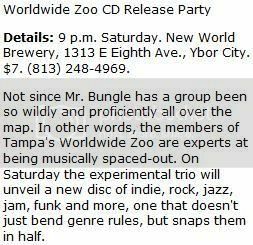 * Here is a nice little clip, courtesy of John Allman, from the Friday Extra section of the Tampa Tribune hyping our 08-12-06 show at Bombshell Gallery with Johan Ess. 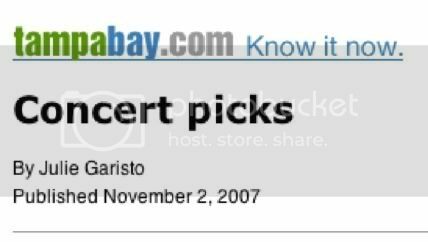 * As featured in the Tampa Tribune in late 2006. 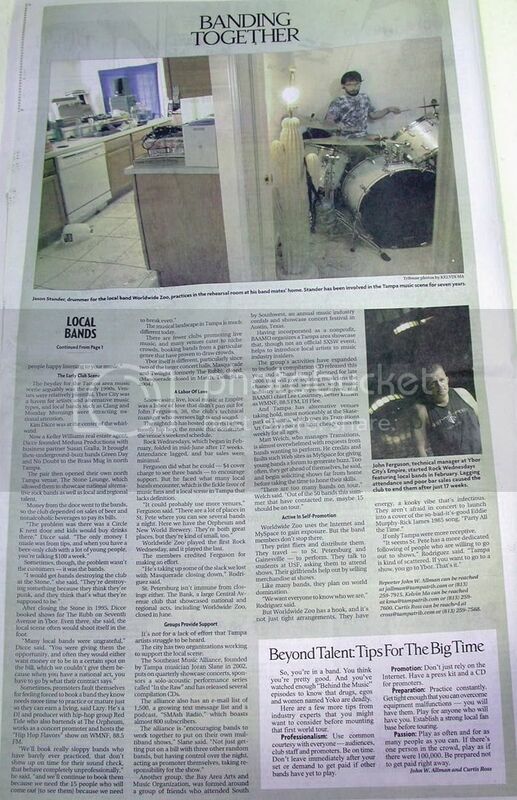 The super-rad story that we were featured in titled 'Banding Together' is no longer there for some reason (it is scanned in below), but another story about the state of the local scene that rubbed a bunch of people the wrong way (possibly due to the degree of brutal truth involved) is there to read if you please...just click the picture below to go to the page where the story is, as well some old(er) live recording mp3s and a fun little slideshow/interview featuring Worldwide Zoo!! 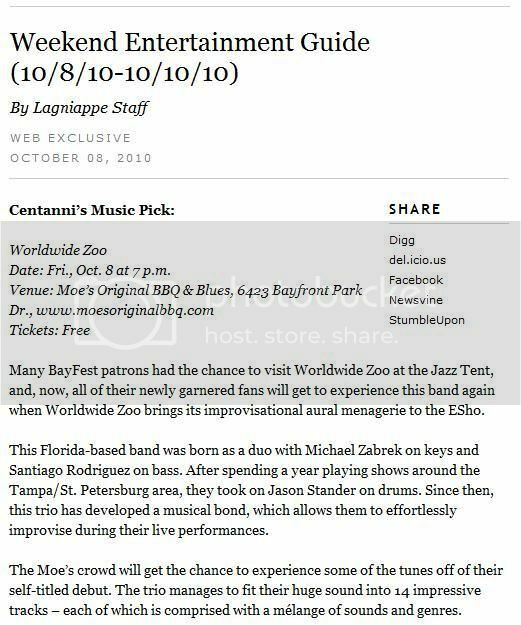 * Worldwide Zoo interviewed in the Tampa Bay Times....before the drum gods smiled down upon us, allowing us to cross paths with the incredible Jason Stander!